It should also be noted that EVGA revised our warranty terms in May, that was a month after the FTC's release. Right I understand that, they use to be cool about it and maybe still are, how there is 2 maybe more posts on the forums right now of them denying 10/20 series RMAs due to this sticker not being there. Hints my concern. I have 2 2080tis, plus blocks, thats almost 3000 dollars in GPUs, I want my warranty in tact. I cant replace the back plate though, because EVGA does not sell said back plate. If they sold it, I would buy it, problem solved. However they do not sell it, I use Hydro Copper blocks, so other back plates are not compatible. If I would have bought EK blocks I could have used EK back plates, and not had this issue, so I am kind of being punished by buying EVGAs blocks, and they cost more. Yep and as a Bench user, with the PC on the back of the card of me, most of the time, thats all I see is a huge sticker on the back of 3k worth of GPUs. Thats irritating. Ek backplate does is not compatible with a Hydro Copper block, and I like EVGAs. If they would sell me some, I would buy them happily to ensure my warranty. I know alot of people are saying its petty, but lets put this into prospective, a lot of people have 3k dollar cars, you think someone would buy a car with a Huge Sticker on it that they were told they could not removed? I pull the stickers off my ram, few weeks in. If the Ram needs RMAed, I will throw it away, problem their is not, it was 200 bucks. A 1200 dollar GPU, ya not the same thing. My card does not have that sticker that says EVGA on it. And I appreciate your reply, however my issue comes in with the fact, that there is posts on this forum of warranty's being denied over this sticker. And that this stickers location is horrid. I understand, not wanting to remove the back plate, to see the sticker. However it could have been on the bottom of the cooler or something. 90% of people that are buying 1200+ dollar GPUs have a window in their case. We do not want to look at this sticker, we dont want to share pictures of our rig and have to go in and black the serial out of the sticker, this is the most ridiculous placement location you could have put it. In the past the location made more sense, there was a hole in the box to see the serial, however that is not the case anymore. My RTX boxes, have no hole that sticker is not shown in the box. Its an eyesore with zero reason for its location. Are you guys ever going to sell the back plate separately? As I will just buy some to make my life easier and protect the sticker as well. Well TBH, the mountain is just adding up. And fingers crossed with never need warranty anyway. However between the gaudy sticker. Custom cable for the leds, so I cannot control with Aura, even when a lot of card company's allow Aura to control their leds stock. As to that, I have rarely had to warranty anything, I dont warranty stuff thats my fault, and I haven't had much stuff break, and the stuff that usually does break isnt worth my time to warranty, less than ~200 and I usually dont bother, isnt worth it. off the top of my head, I have had to Warranty a RIVBE, a Sapphire 290x, and a Corsair PSU, all of those went great, with zero issues. I know others have problems, I haven't. Also like I said, if I would have bought any other block from any other company I could have used their back plate and there would be zero issues. So now I am being punished for supporting EVGA further and using the HC blocks. And I realized and pointed out, that are shady people, but that is even more reason to say is this sticker on a Removable back plate? The date of purchase stuff makes sense in some light, but as the OG owner of a Card from EVGA directly, and my second card is from new egg, first is registered second will be tomorrow when it arrives. The dates are registered, Invoices logged, and to be told stare a ugly sticker on your 1400 dollar GPU, or lose warranty is a kick in the face. Sounds class action to me. That's sticker is worth $1400. The price of an ounce of gold I bet. I wonder how much losses have these companies endured on scammers who play the sticker game? Not saying this is the case here but we should also give it a chance and see it from a different angle on why the things are the way they are. Right well that's a good point, which is why I stated the backplate is a bad spot for this. Not only that, but for that very reason, as someone else said, the Serial should be etched into the card, that way there is no "Sticker Game". That said I don't really see how the "Sticker Game" could cost them anything. In my experience at least, a GPU doesn't really die after years, unless it's killed or damaged. Even degredation I'm not sure about. My 290xs we're on custom bios pushing 425ws at insane clocks, back when they were semi recent, my step brother still runs them (he is about to replace them now) at 425ws, every day, for what 5-6 years? They are still just fine. Not only that, but I bought them as Used Miners, and custom biosed and pushed the brakes of them, 6 years later, and they are still running. The 3 I sold to him anyway don't know what happened to the other 2. The original argument was that the sticker is illegal. It is not. Even if it isn’t aesthetically pleasing, it is still legal. If you don’t want to see the sticker, spend a couple of dollars on a roll of black painters tape and cover the sticker. Painters tape should peel off without damaging the backplate or the sticker, and will conceal the sticker from view. If you are willing to throw away $200 ram because you admit to throwing away the sticker, then this shouldn’t be a problem here. You openly admit to knowing the sticker voided your warranty on the ram which is why you throw away the ram. It almost sounds like you hold a double standard based on price. Cars do come with stickers, some that can’t be removed. That is why people research before they buy, not after. That argument is relatively invalid as the VIN number is stamped and printed all over the car, even in plain site sometimes. If you removed the vin number, you wouldn’t have a warranty either as you couldn’t prove the vin for the car is correct. Since you mention cars, if you were to remove the stock radiator and install a high performance radiator and it caused problems with the engine, you would like void the warranty for making mechanical changes that were not authorized. Sounds like the only way to settle this is in court. At the very least we should all complain to the FTC, let them threaten legal action. It is CLEARLY illegal. Which part is clearly illegal? It seems totally legal to me. Please fully read the_scarlet_one's response #22 on the previous page. The intent of the sticker law is to make it illegal for stickers to be used as anti-tamper devices which prevent users from repairing or servicing their products. EVGA never has prevented users from repairing or servicing their products. So, which part is illegal? I agree. I don't understand why being able to see the supposedly ugly sticker is such a big deal, but if it could be hidden better, why not hide it a bit better? EVGA should place the sticker on the side of the cooler facing the motherboard/PCI-E slot. Then, no one could see it when the card is installed. And, if someone takes the stock cooler off to install water cooling, the user has to keep the stock cooler in a safe place to reinstall later. Nothing in the warranty terms would change since the user is already required to retain the stock cooler for warranty reasons. But, of course, some coolers would need to be designed differently to have an extra piece of metal/plastic added, big enough for the sticker to attach. Yes, you get 2 dollars, the lawyers get 700 million. Not a good choice. TALK to the company nicely instead of being a jerk. No it doesn't. It shouldn't. Show us a picture. 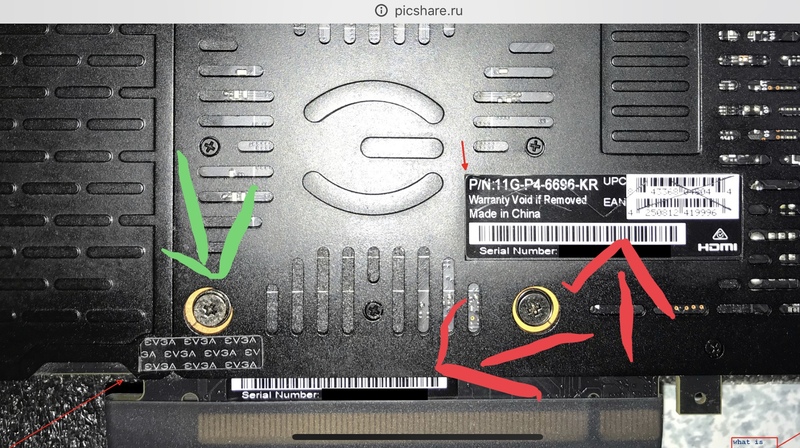 There is one sticker that may cover one screw, and it is the EVGA EVGA EVGA sticker that doesn’t say anything about warranties. Its probably the same non-issue sticker that has been around for nearly 3 years that doesn’t affect warranty at all but people keep assuming it is a warranty void sticker. The sticker below the green arrow is not a warranty void sticker. One sticker does, it is the EVGA EVGA EVGA sticker that doesn’t say anything about warranties. The same non-issue sticker that has been around for nearly 3 years that doesn’t affect warranty at all. Yes, but how many times does the conversation need to repeat? I would have to assume that the person read this thread before posting such a claim. That's why I asked for a picture to avoid confusion. It needs to be repeated every time someone assumes the wrong thing, as it has been for 3 years. There are still articles that can be found saying that the tamper sticker will void a warranty from when it was originally introduced, and even though is it explained constantly, people still think that it will. Hopefully the user above will provide clarification of the tamper sticker isn’t the one they are referring to. I didn't realize I had one more screw because of that silly sticker. I get it's there to tell EVGA it's been tampered with. Luckily I didn't snap my blackplate and PCB in half because of that dam thing. Wish they never did that OR at least give us a heads up as it wasn't mentioned in the Hydro Copper instructions manual but other than that, all is well. Edit: I should note I'm talking about smaller EVGA branded sticker and not the serial. The serial number sticker is placed on a flat, blank spot on the backplate and does not cover ANY screws. If your sticker was miss-placed please send photos to support@evga.com so that we may assist.